This morning as I drank my coffee, I looked out to see the very first rays of sun hitting one of my yellow dahlias. I had to go get my camera. The result is nothing short of Morning Glorious. Rays of sun on my neighbor’s cat. Clouds at sunrise a few days ago. More clouds at sunrise. This was truely a lovely sunrise. Hope you have a glorious weekend. You are right, Yael–these photos are indeed morning glorious! The sky was so beautiful–what a lovely way to start the day. And you had a cat to help you! It was really a treat to catch the early sun on my garden. Hope you have a wonderful weekend. what a beautiful post!!! your photos are absolutely wonderful!!! I shared this post to tootsie time facebook page!!! thanks for linking in this week I hope you will again soon! Thank you. I am honored. Thanks and thanks for coming by. I just could not resist taking these shots. Thanks for coming by. And thank you. This was an impromptu post when I saw that sun on the flowers. A beautiful post and mosaic of flowers Yael! Thanks, and thanks for coming by. Love the cat photo, too! Aside from taking the flower photos, the cat photo was oo good to pass up. He comes almost every morning now and it’s on that bench. Drives my orange boy nuts. Beautiful flowers, the dahlias are my favorite. Love the skywatch shots! Beautiful mosaic and photos. Have a great week! Thanks. My dahlias keep going and going. I have two new ones that habe buds nut have not even bloomed yet. I hope they do before it gets too cold. I love it when you see something exceptional in the garden and can capture it on your camera. Kitty has an aura of sunbeams on him, very pretty. Thanks. I loved getting those shots. Kitty too. Thanks and thanks for coming by. Hi Yael, Your dahlias and sky photos are truly beautiful. I love the backlighting! Thanks. I enjoy getting neat photos of backlit objects Thanks for coming by. You are doing very well to be up and at’em at sunrise. The flowers all wakening to the sun are pretty glorious indeed. I recently saw a video of a dahlia garden on You Tube. It sure made me want to have a lot of them next year. Thanks. It’s not hard to understand why early morning and late afternoon are good times to take photographs. I do love dahlias. I hope you get to experiment with them. If you can, go to a dahlia farm around August. It is wonderful to see so many beauties up close. Beautiful! I love the orange yellow dahlia. Thanks and thanks for coming by. That orange yellow one is one of my new ones and I relaly like it. I love dahlias and yours are gorgeous. The cloud pictures are such a beauty too. Feel free to swing by and link up with my Tuesday Greens blog hop at http://www.craftygardenmama.com. Have a great week! Thanks. 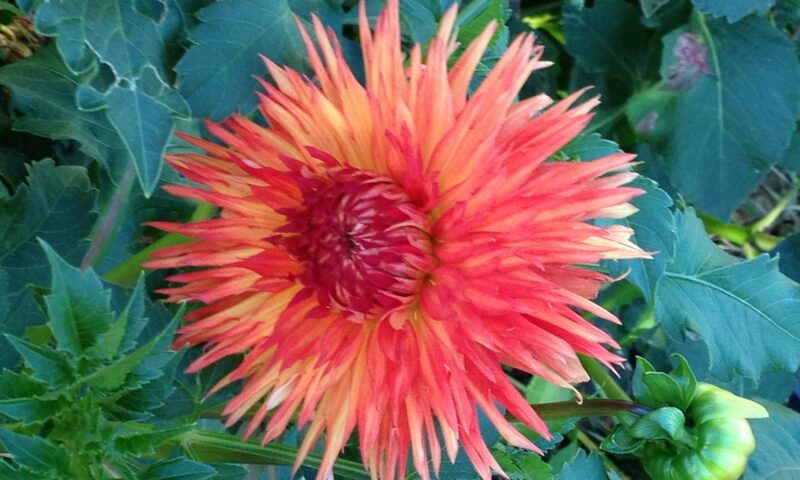 I really do love dahlias and I love it that they bloom well into fall. Thanks and thanks for coming by. Hope your morning is as beautiful as another one here. What a glorious morning indeed. Thanks and thanks fr coming by. What is nice is that we are still having such beautiful mornings…..at least until the fall rains start. So far so good. Beautiful! thanks for linking up! Thanks and thanks for reciprocating. Hope you are having a great week. Thanks and thanks for coming by. I really liked your sedums too. Hi Yael, I found you too! Love your dahlias…the red pinwheel is my favorite. I do see you found me. Thanks. That red pinwheel dahlia is one of my favorites too. Looking forward to seeing you Saturday. Beautiful flowers in the sun! The sky is amazing! I’ve been away from home and didn’t participate in Bloomin’ Tuesday this week. I will miss Jean and all the other gardeners. Take care! Thanks. That sky was too good to pass up. Sorry you didn’t make it by Bloomin’ Tuesday. See you next time. Lovely pictures, especially that first one of the clouds. I’m very fond of that cat picture, too! My favorite thing to be back-lit in the sun are the grasses. I just love the way they sparkle. Thanks. The orange kitty is very friendly and nice I just wish my orange kitty wouldn’t face off with him/her. Gorgeous! Especially love that first dahlia. Thank you and thanks for coming by. I love that dahlia too. Thanks so much for your visit! !